Ukes4Fun Songbook 9! Another ten songs for ten singers! You can download Songbook 9 by selecting the image above or by going to main “Songsheets” page (there is lots of other info about the Songbooks on that page, so have a look if you haven’t visited it before). As with Songbook 8, I am trying to share out the uke-lurve by including as many different singers as possible in each song book. Apologies to those who have not yet been included in Songbooks 8 or 9 – your time will come as soon as you have sent or approved the song files. Many thanks to Andy, Brian, Denis and Jazzy for providing copies of some of these arrangements – it makes my job much easier! If you spot any typo’s or errors, eg. in terms of deviating from the way we play these songs, they will be of my doing – and please do let me know so that I can correct them. Ukes4Fun Songbook 8! Ten songs for ten singers! You can download Songbook 8 by selecting the image above or by going to main “Songsheets” page. This the first installment of a shortlist of over 30 current songs. There are more on the “back burner”, where I am waiting to see if they take-off and then have staying power. I am trying to share out the uke-lurve by including as many different singers as possible in each song book. Apologies to those who have not been included in this Songbook – your time will come very soon! Many thanks to Andy and Denis for providing copies of most of these arrangements – it makes my job much easier! Correction 1: Apologies to Megs, who I had listed as leading “All My Loving”! So that means that Andy has got in twice, it is really 10 songs for nine singers – and we both owe Megs a beer? Thanks to Brian for “Act Naturally”, Denis for all the Geordie Toons, Andy for the Ukemeister’s version of “Over The Rainbow” and Andy and Jazzy for checking my two simplified versions. Jazzy would love more of us to be able to play along when she sings her heart out doing “Over the Rainbow” so I am hoping everyone will be able to manage one of the three versions. They should fit together sound-wise and I have marked “optional” chords in all three. This should give us “improvers” a chance to build up skills with practice and gradually clamber our way over that rainbow! Now better get my skates on or I will be late for the Tune Army gig! 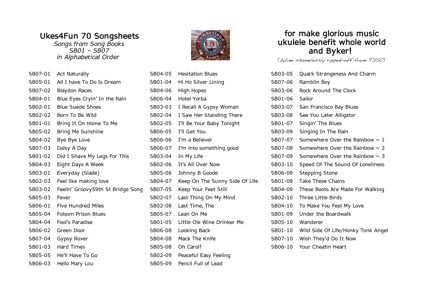 Songbooks updated and some advice for the uke-obsessed! Reverse the sexes and that looks uncannily like an evening at my house! I have included some info and advice about preparing to introduce new songs to sessions (have to try to remember to follow it myself now, of course) and getting new songs into future Song Books. Please let me know which of your favourites are missing and I will put them on the list for the next Song Book – there is info on the Song Sheets Page about the format you need to use so that I can submit them to the magic-wrangling of Songsheet Generator! 2 May 2011: Songbooks 1 to 4 are now available in APHont (for easier reading) Landscape format (to take up less space) – see links on Ukes4Fun Songsheets Page.